There are so many books published every month and not all of them are worth reading from everyone’s point of view. At the same time, some of them are loved by the masses and recognized globally. The commercial success of the book is really a necessary consequence for the author and the publisher. A book is a special type of creation which is the result of a long journey where the author is emotionally attached to the content and the characters. Reading a book takes one to the new world, the world of imagination. Our mind visualizes the nicely written scenes and it eventually boosts its power and makes it sharper. So when someone refers a book as a product, if often doesn’t go well with the people associated with it. But, just look at the books floating around us. Does the majority of them have a substance really? It doesn’t matter if it is a bestseller or not, it can still be something not worth your money and time. And at the same time, some authors come up with a story which is worth telling. May be it is not going to become a bestseller, but still, it can be a tribute to some unsung hero(es). 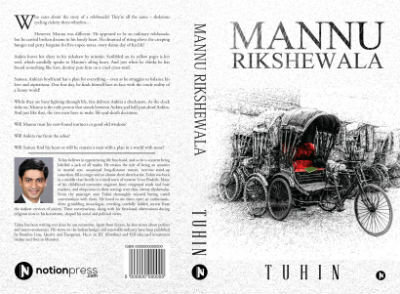 I got dived into these thoughts by reading the foreword of a book named Mannu Rikshewala by debutante author Tuhin Harit. The following lines are really touchy. We as Human beings need to learn to practice humility and recognize the God in all human beings. After all, this is what Namaste means – The God in me respects the God in you, the divinity in me salutes the divinity in you, and the potential in me recognizes the infinite potential in you. This is learning from our part of the world, a country that is today called India and yet we as the people of India have forgotten this original wisdom and fail to see the God in every human being. Rather than talking more about it, I will suggest you to go through this emotional account. Let us take a bird’s eye view to the plot of the book. Mannu is a rikshewala who is trying hard to meet the hands. For him, there is no salary at the end of the month. It is up to him to earn something for the day. The economics is pretty simple for him. The day he doesn’t go for the work, he will not be earning anything. And the people, who don’t think twice when paying thousands of rupees bills in a hotel for one-time food or at a mall for a pair of cloths; always try bargain for as little as 5 rupees with him! And still, he heard many of the passengers complaining about these “cheater” rikshewalas! He was never able to understand it. In addition, the bad weather or angry policeman often comes to his way. And the people riding bikes often scold him for no reasons. Getting into a scuffle for no reason and got beaten up is like a routine for him. He also wanted to study and become someone who can be distinguished. Someone with an identity or recognition. He also needs to earn money so he can get his sister married to someone decent. Sameer is living the life of any other executive in a metro. He often caught in his routine so much that he started forgetting that life is to enjoy as well. He started disliking his job and wanted to do something which fills in enthusiasm in him. Ankita is working for the greater good. It is tough to imagine that someone of her caliber is not doing a job which can earn her a handsome amount. She rather loves to do work towards making the society a better place. Her love relationship with Sameer got affected recently. Of course, they meet on the regular bases and they have their moments of love and job, but the spark they were feeling in the beginning of their relationship is missing somehow. How the fate makes these 3 fellows crossing path with each other, how an ordinary guy becomes a hero for someone and how their lives moved on, is the rest of the story. And no, this is not another love story by another engineer! If anything, it’s a life story! And if that’s love, then yes, this is another love story by another engineer! It is the story of Mannu (the rikshewala), Ankita (the passenger) and Sameer (the commuter). The book is written with a perspective to talk about unsung heroes we meet in our daily lives but often don’t recognize them. Possibly we even don’t care for their existence. But, sometimes such people can also do something extraordinary. It is definitely not a subject anyone can decide to choose if the commercial success is the sole focus for him/her. So we need to give some extra credit for choosing such subject to Tuhin. The writing style of the book is quite good and the characters grow up gradually and you feel the emotions they passed through. While it is good to land into the world of the fictional rikshawala (where a lot of things are inspired by the real hectic life they are actually living), the realities explored might disturb you. And there is some stuff which is strictly for adult readers. Mannu’s heroic actions are also presented quite realistically, but there are chances, that the rescue segment may look a little filmy. Of course, we can grant that liberty to the author, as truth is often stranger than the fiction :). The masterstroke the author played, however, according to me, is the climax of the book. A reader usually could have expected a filmy end (based on the last few segments before it), but it is quite realistic. Love story may have an ending, life story does not. Love story may have a destination, but a life story is just a journey. And when he opens his eyes, there are tiny drops of tears in their corners, waiting to be swept away. In such a situation, when everyone is packed with negative time credit, this is rather a rare opportunity which fortunate people get, to express their anger, largely to themselves. And as it happens so often, he is not prepared for what fate has in store for him. Her mother would look at her and feel content, like an artist whose masterpiece has come out exactly as she had dreamed. In any society, cultural heritage and moral conduct are the first things to be thrown out when the safety or survival of its members is threatened. … like passengers in two boats coasting away from each other; they need to oar towards each other desperately if they want to stay together. But relationship, as he now realizes, is tough. As anything else in life, it needs patience, time and care. “Why would anyone cycle? If they like cycling, they can cycle my rickshaw some days. And give me a much needed break” he thinks. She becomes aware of her mind’s ability to trivialize an unimaginable amount of pain and focus on something more important. I realized that it is about having the courage to do what’s right, having faith in oneself and in others, loving without expectations and caring without a word. I think the deepest realizations happen when you’re the most shattered. Never stop reading. You’ll surprise yourself one day. As you yourself can see, the book contains a good mixture of philosophy, reality, innocence, wisdom, inspiration and much more in its content. Don’t skip reading foreword of the book and do read author’s vision about the book as well. And it will surely raise your expectation for the reading material you are going to uncover. Don’t read this book with many expectations and it will amaze you at many places. The book has a substance and it tells a story worth reading. But as it is realistic, it is not for everyone. If you love meaningful reading and mature content, you will surely enjoy it. It is hard hitting and satirical at places too. 8 stars out of 10.